When Louise is dumped by Mike on their twentieth wedding anniversary, she faces the daunting task of picking up the pieces of her life. She can either choose to persevere in her adopted hometown of London, bolstered by dear friends and the fashion business she loves, or return to her native Sweden alone. Can she find happiness with an old flame in a city she avoided for two decades? Or will her ex’s violent, criminal past haunt her forever? As Mike becomes increasingly unhinged, the choices Louise makes could prove fatal. Will she ever be able to say goodbye to the past and start afresh? On her twentieth wedding anniversary, Louise’s husband, Mike, gives her a gift she wasn’t expecting. He tells her he wants a divorce. Stunned and afraid she now has to manage to pick herself up and carry on. There are decisions to be made-choices to make. Should she stay in London, the town she embraced as her own years ago? The town where she had made close friends and that possesses the fashion industry that she loves. Or should she return to Sweden her original hometown. Little does she know that her future will be touch and go and even menacing. We Never Said Goodbye By Helene Fermont is a praiseworthy work of fiction. It is filled with emotion and drama as it deals with many different realistic life issues. The characters are fully developed and described with interesting personalities, some likeable and some not so easy to like. I was particularly impressed by how she wrote the dialog between the characters. It flows beautifully and is very pragmatic. I could really relate to the main character Louise as she struggles to make her life right amidst the ups and downs. The descriptions of the towns and the scenery is filled with delightful vibrancy. I felt like I was right there experiencing everything that Louise and the other characters were seeing, feeling and experiencing. This is a heartfelt story with romance, and I was drawn straight in right from the start, routing for Louise and hoping that everything will work out for her. There is a lot of serious situations and drama and I found myself tearing up as I read on. 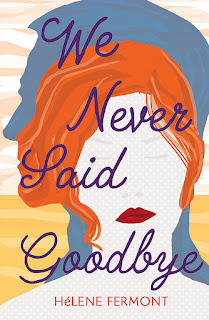 We Never Said Goodbye is a touching story and an effortless read. I was captivated as it held my interest throughout. Author, Helene Fermont, has a way with words that attracts and holds the reader's attention intently. Her voice is unique and engaging. She writes in a very relevant meaningful way. I’m looking forward to hearing more from her and reading her next book. I recommend this touching story to all avid readers that are looking for something fresh and unique.